This Labor Day weekend, enjoy the last bit of hot weather by having an outdoor picnic with your loved ones. Create some summertime memories that will last you through the chilly winter. Spend the entire day outside with good friends and fun activities to celebrate the end of the season. This weekend date idea will get you and your friends feeling the summer vibes way past the end of summer. 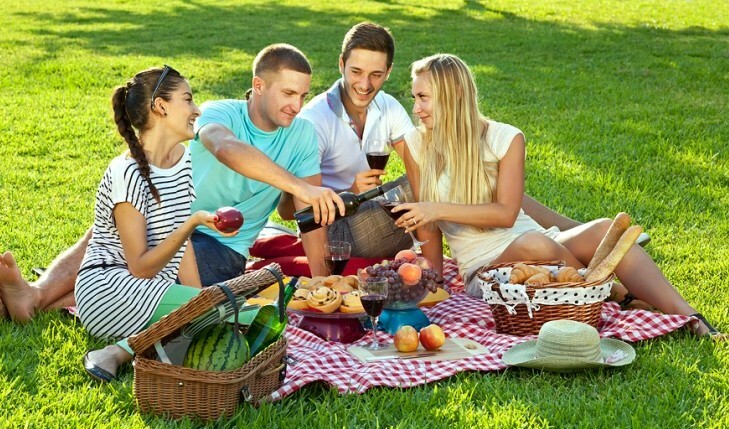 This weekend date idea will be the summer picnic that you won’t forget! Make it a party and ask for a double or even triple date! Pack tons of great snack foods like grapes, cheese and crackers, and a vegetable tray. Don’t forget some wine, chilled, of course. It’s perfect for sipping on a hot afternoon. Grab a disposable camera and have fun taking pictures as a group for an end-of-summer photo album! Pack a deck of cards and play poker or spades, betting on your favorite candy. If you’re feeling more active, partner up with your love and play some volleyball. Toss around a Frisbee for less competitive fun. If you’re really into sports, bring a baseball and some mitts and batter up together. If there’s a lake nearby, bring some fishing poles and catch your dinner. Step out of your comfort zone and try something new – your partner will appreciate your willingness to get a little dirty. When the sun goes down, keep the fun going for your date night. Find a park in your area that has grills and turn your group picnic into a barbecue. Everybody will enjoy cooking their favorite foods and unwinding with their closest pals. Break out the hamburgers and hot dogs and pair them with potato salad, fruit salad, and homemade chocolate chip cookies. You can even treat yourself to some unique picnic cocktails, like mimosas in mason jars, white wine spritzers, fruit-filled sangria or even a vodka-filled watermelon. Be sure to bring extra ice to keep your drinks cold. Maybe you invited a few single friends too. If so, now is the perfect time to introduce them! Give them cooking duties together or force them to be on the same volleyball team. Share love advice with them to help them get back into dating. They will get a chance to know one another in a no-pressure environment. Be sure to bring an extra blanket in case they want to cuddle up under the stars. How will you celebrate Labor Day? Tell us in the comments below!